I'm Still Failing To Stop Playing Animal Crossing: Pocket Camp. Now Thanks To Butterflies. Ugh. Now this game has rare butterflies. Butterflies! Apparently that’s all it takes to keep me invested in Nintendo’s mobile Animal Crossing game, Pocket Camp. Butterflies and one of the franchise’s iconic characters, Rover. Last Thursday, Nintendo dropped a Direct Mini showcasing some of the games headed for the Switch. As 15 minutes of news of ports, DLC, and new games rolled by—a new Mario tennis title, one game praising the sun, and a port of The World Ends With You, the game about cheating death with fashion and pins—my hopes for a 2018 announcement of a new, mainline Animal Crossing game shriveled up into despair. After momentarily being distracted by Luigi’s dapper bow tie for his Balloon party DLC coming to Super Mario Odyssey, I went back to engaging with Nintendo’s recent update to Pocket Camp. Mindlessly tapping my phone has become ingrained into my day, and last week’s update of a rare butterfly event ensured that I’ll keep doing so. It’s a cycle of planting, replanting, visiting players’ yards to share butterflies with them for the opportunity to get rare red dahlia seeds, watering each others’ gardens, waiting for flowers to grow, then catching all the butterflies like maniacs. There’s a caveat in that butterflies that appear in the garden will not guarantee a 100% catch rate, making it a frustration endeavour in trying to amass a collection for those sweet rewards. Players could pay leaf tickets, Pocket Camp’s special new currency that can be earned in the game or bought using real money, to ensure success. But at ten leaf tickets per butterfly, I refuse to use them. There’s also no way I’ll be that person who indulges in micro-transactions. No, I’m just the person who will keep up the garden-tending grind, and enjoy helping out others in the Pocket Camp community, to rock a Rover hood. Like this awesome stranger I befriended, TOM. This man is an inspiration. The same reason I was still playing Pocket Camp before the new year, is the same I’m still playing now—the small sense of community drives me. But I’m noticing something else, too. Something I’m becoming even more excited about when I addressed it the last time I mulled over this game. I’m still hopeful for a new Animal Crossing. Pocket Camp still isn’t the pure experience to satisfy that itch. While it’s nice to see how 2013's New Leaf’s emoticons have been (surface-level) implemented into Pocket Camp’s photo mode, or centering furniture—the long overdue mechanic introduced in 2015's Happy Home Designer—has carried into the mobile outing, I’m beginning to wonder what is it from Pocket Camp could be utilized in the next Animal Crossing game, should we get one. I don’t want to spend my time in a main Animal Crossing dealing with micromanaging my town which Pocket Camp is all about. That’s the opposite of the game’s spirit, and part of what makes Pocket Camp so frustrating. These new seasonal events, however, which contribute to earning special rewards are kind of cool. Animal Crossing has always had seasonal offerings tied into holiday events. Building a snowman family in winter? Yep, that’ll earn you some furniture. The same with spooking animal neighbours in trick or treating on Halloween night and the month long-build up to collecting candy. Pocket Camp makes it harder to grind for items because there’s not much else to do in-between fulfilling rote and repetitive quests for the animals, giving the mobile game a soulless quality to it. It’s not that Pocket Camp isn’t following some of the mini-events that mainline Animal Crossing games already have. What’s happening is that they’re introducing some new ones that could be expanded and could even be incorporated for multiplayer events in a future game. Pocket Camp’s butterfly event gives Animal Crossing iconic characters a new way to interact in the world. A sectioned off garden as a public works project (introduced in New Leaf) with a mini-game tied to it sounds a great way to increase interaction with other players, and a wonderful feature to personalize a town. Yeah, it could be done with initiative and planning—some people make orchards out of their Animal Crossing towns (!! )—but smaller guided play, as with the public works projects, could be interesting. When Pocket Camp launched world wide in late November, it was a bare bones game with a series of stripped away gameplay and simplified transactions. It hasn’t changed that much at its core. The introduction of smaller, focused events—even with their grind-worthy annoying time sinks—have made the game easier to digest and given it a bit more substance. 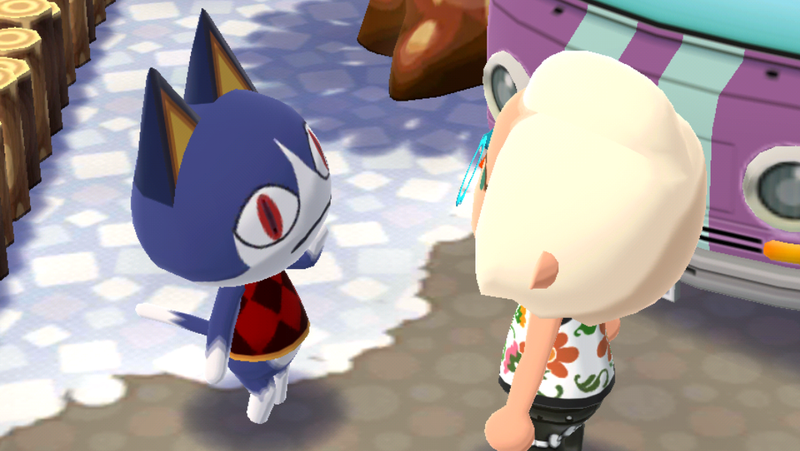 We’ll see where Pocket Camp lands in the future but with the introduction of more animals rotating in every few weeks, more options of furniture and camp ground amenities, and more ways to have a network of people helping, it’s a game that slowly taking shape into something that’s slightly better. And yeah, I guess that means I’ll keep playing.